Every parent knows the importance of healthy and regular dental hygiene routines for their children. Getting your child to brush morning and night and remember to floss and use mouth wash can become a heavy task to take on. When your child can look at dental hygiene as a fun chore to check off each morning and night, their teeth will reap the rewards of proper oral care. Choosing the appropriate tooth brush is a big step to helping your kids get excited about keeping their teeth clean and strong. Toothbrushes come in a variety of shapes, sizes, colors and bristle counts. One of the first things to look for when purchasing a new toothbrush is if it ADA certified. An ADA seal on your toothbrush means that it has been evaluated for safety and effectiveness by an independent body of scientific experts, the ADA council of Scientific Affairs. You want the best product possible for your kids, so start by purchasing a toothbrush that is proven, safe and effective. There are a great number of toothbrushes that are ADA certified and will get your kids excited about brushing. Having your children brush twice a day can be difficult, but ensuring that they are brushing for a full two minutes can be a struggle in itself. You can purchase a toothbrush that will help them brush for the recommended amount of time. Tooth Tune tooth brushes will play your child’s favorite songs for the amount of time they are meant to be brushing. This will help your child to keep scrubbing until their song is finished playing, ensuring that they cleaned their teeth thoroughly. There is also another toothbrush that has a flashing timer that will continue to light up until your child has brushed the appropriate amount of time. Crest makes a great toothbrush that features children’s favorite characters like Spider Man, Hulk, Little Mermaid and Iron Man. These toothbrushes are powered toothbrushes that might make brushing more fun for your child. A powered toothbrush works just as well as a manual toothbrush, massaging gums and helping prevent plaque on your child’s teeth. Proper dental hygiene for your child is essential to their having a healthy smile in the future. 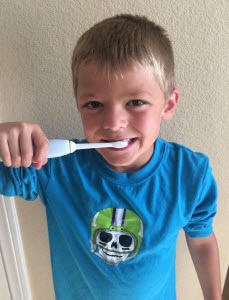 Choosing the right toothbrush for your child is a simple and easy step to take that can make a world of difference in their desire to brush every day and night. Take your child to pick out their new toothbrush, get them excited about keeping their teeth clean and put them on the track to a lifetime of healthy smiles. Is Wisdom Tooth Removal Ever Necessary for Children? Wisdom teeth are often referred to as the third molar. They are historically called wisdom teeth because they appear later in life – later than when the other teeth develop, and when young adults are presumably “wiser” than they were as a child. Your Smile Reef pediatric dentist will perform an initial evaluation of the wisdom teeth as early as age 16. All too often many mouths are too small for an additional four molars and tooth extraction is recommended. Smile Reef Pediatric Dentistry has provided a list of signs and symptoms that may indicate that the wisdom teeth are about to erupt or have already erupted; these symptoms include pain, infection, facial swelling and swelling of the gum line in the back of the mouth. To determine if the adjacent teeth have been damaged an x-ray may be performed of the tooth and an antibiotic administered to the patient to reduce infection. Tooth extraction refers to the painless removal of a tooth or the roots of a tooth with minimal disruption and trauma to the surrounding tissues which also helps to insure the socket wound heals quickly and completely without post-operative complications. More and more dentists believe it is better to remove wisdom teeth before they have erupted and even before the roots are fully formed, when the patient is younger and will recover faster from surgery. Your Smile Reef Pediatric Dentist may recommend removing your child’s wisdom teeth before the teeth begin causing problems and become more firmly rooted in the jaw. It is common for wisdom teeth to be completely impacted. This means that the teeth have not erupted through the gum into the mouth. If the wisdom teeth are causing pain and other complications, most dentists and oral health specialists will recommend immediate removal. An impacted wisdom tooth can cause many problems including bacteria and plaque buildup, cyst development, tumor development, infection, jaw and gum disease and decay of the tooth adjacent to the wisdom tooth. 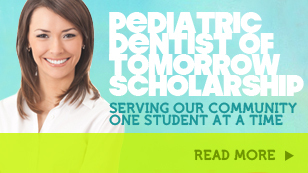 Your Smile Reef Pediatric Dentist will explain what is involved in the extraction procedure. Wisdom tooth extraction surgery involves making an incision through the gum tissue over the tooth. The connective tissue between the tooth and the bone is gently detached. After the tooth is removed, the opening in the gum may be sutured. Sometimes the wisdom tooth may need to be cut into sections to remove it. Most wisdom teeth extractions can be performed in the Smile Reef Dental Office using the best method of anesthesia for your child. The decision to remove wisdom teeth isn’t always an easy one. Talk to your Smile Reef Dental Pedodontist about the position and health of your child’s wisdom teeth.